Dawn G Designs: New Cards and update. It has been a while since I've posted anything so I will update you on some things. I did very well at the small craft show/yard sale. I sold 2 mini chipboard albums, 3 cards and 1 die cut. There wasn't a lot of people so I was happy. I just finished an 8 1/2 x 11 9 page chipboard scrapbook album for a friend. She asked me to put all the pictures in as well. I struggled for a little bit than I got in a groove and finished it up yesterday. I think it turned out well and my husband said that she will love it. Today I worked on some Thank You cards. the butterfly card I copied off of Christines Creations. It was so cute and I had the stamps I had to make it. I am getting ready for a huge Fall Festival in October so I will be making tons of cards and mini albums. I will post pictures as I finish them. If you are reading this thanks for stopping by. I'm thinking of doing some blog candy. Leave a comment and let me know what you think. Here are the pictures of the cards I made if you like them let me know by leaving a comment. Hi my name is Dawn. I am a wife, mother and grandmother. My love for paper crafting came in the form of Scrapbooking in 2009. Since then I have expanded to other forms of art but I still love making cards. I’m a Breast Cancer survivor and the mother of my precious son who has Down Syndrome. I hope to inspire you in your creative journey. 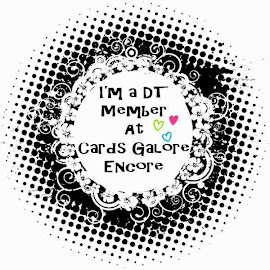 I'm on the Cards Galore Encore DT team.